What Does Brown Do For Express Shipping? I stumbled across this place on Monday night. There aren't many places to get a good meal in the French Quarter after 10:00 PM. This is one of them. Located right in the middle of all the insanity and debauchery that is Bourbon Street, it's around the corner from the world famous Arnoud's and Arnoud's jazz kitchen (where I once had an awesome turtle soup). Though I didn't realize it at the time, it is actually part of the Arnoud's family. I sat down to eat at about 10:30 and was ready to devour the silverware after a long day on the trade show floor at HIMMS. I couldn't decide what to have so I just ordered "A Taste of the Bayou." First came the File Gumbo in a metal plate/bowl. It was amazing. It had a rich smooth flavor with just a little heat. I could have eaten another gallon of it. Next came the Craw Fish Pie and Jambalaya. The portions were respectable, but not ridiculous like you sometimes see at the Cheesecake Factory. The Craw Fish Pie was, well, a craw fish concoction with the texture of warm tuna salad. It was baked in a pastry -- kind of like an old school Hot Pocket. But it was so much better. The creole flavors were great and the warm texture made it something that would be perfect on a winter's day. Though I don't think they have many of those in Creole country. The Jambalaya was good, too, though I didn't enjoy it as much as the other two items. It was a little drier that I expected. If I hadn't had the Gumbo first, I probably would have enjoyed the Jambalaya more, but the Gumbo set the bar incredibly high. Top it off with an Abita draft or two, you've got a fantastic New Orleans late dinner. Check in at the airport. The check in agent weighs my bag and informs me that since it is 53 pounds, and three pounds over weight, I need to take out some stuff or pay $25. I pay $25. Watch Continental Gate Agent call for first class and Continental Elite members to board the plane. Watch and smile as she chases away several people who tried to board before their group was call. Watch and smile when a few minutes later, when she moves on to the next group she again chases those same people away because it wasn't their turn to board. Lean against the aisle armrest in my seat while the passenger in the middle and window seats sprawl out. They are apparently travelling together. Finally find the Regional Jets gates and IAH. Find the President's Club at IAH. Spill coffee in the President's Club at IAH. Gate Agent announce s slight delay to due to mechanical issues. Start looking for comfortable places to bunk down in IAH. Gate agent explains the mechanical issue was a tray table that wouldn't stay up. Since that's a safety/evacuation issue, they had maintenance replace it. Observe that the 40 minute maintenance delay gave them plenty of time to apply plenty of duct tape to the offending tray table. It was probably 1 minute to apply the tape and 39 minutes to have the paperwork signed off. Watch luggage from my flight come out. Observer that my baggage was not among the luggage that came out. Pick up my luggage at the check in counter because it came in on an earlier flight. And they thought people were more likely to look for their luggage at the check in counter than at the baggage carousel. Leave BTR airport to drive nearly 90 miles to New Orleans. Arrive at Loews hotel in New Orleans to turn in rental car. They tell me they can't take returns on Sundays so I need to bring it back tomorrow. Reach my hotel room at the Doubletree in New Orleans. A few months ago, I found these pictures on my harddrive. 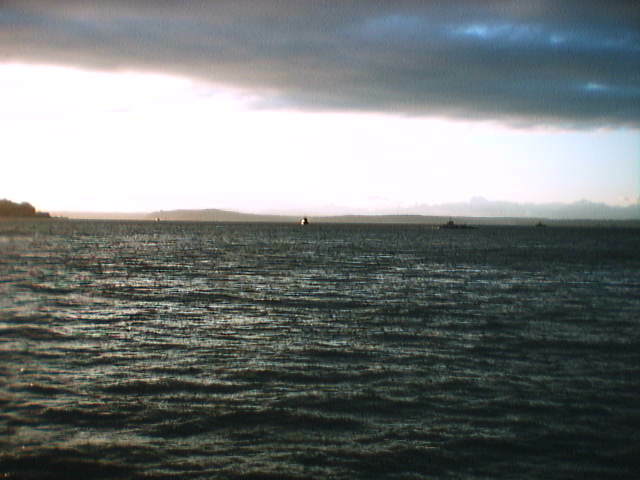 I took these with an old digital camera in 1999. The camera I used is about .3 Megapixel. But the lo-res, lo-quality camera gave me some nice shots. 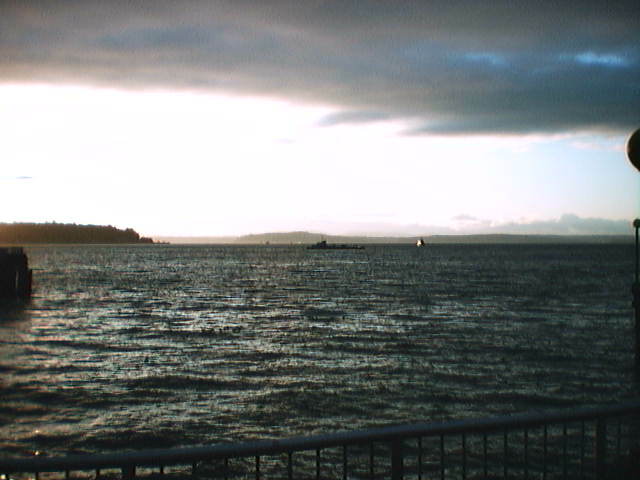 These are from the Seattle waterfront. This year, Alaska Airlines celebrates 75 years in business. They are also in the middle of a fleet replenishment and are phasing out the old MD-80s and replacing them with 737-800s. They get 1 to 2 brand new planes each month. To celebrate their aniversary, they had one of their brand new 737-800s painted in the classic 1940s-era DC3 Livery. The "Starliner 75" is scheduled to enter service in early March and I can't wait to fly in it. It's a beautiful aircraft. As her frightened mother sat nearby in a waiting car, Spears lashed out at an empty car, repeatedly beating the doors and windows with a furled umbrella. NBC launched a great show this season. If you're among the few remaining fans of "Studio 60 on the Sunset Strip," it's time to say farewell. The drama about the goings-on behind the scenes of an "SNL"-like sketch-comedy show drew its lowest ratings of the season Monday, prompting NBC to place the series on hiatus, which is network-speak for "kiss it goodbye." The network that has room for America's Got Talent, The Biggest Loser, Deal of No Deal, Grease: You're the One, Las Vegas, Poker after Dark, and To Catch a Predator no longer has room on its schedule for Studio 60 on the Sunset Strip. I have piles of wires and cables in my luggage an notebook bag. I've been relying on twist ties to manage them when packed, and to corral them in use. It's a cheap, if temporary solution. I've been looking for a better one. At the October 2006 Digital Life Trade Show in NYC, I found the Cordgo. The Cordgo is a round, plastic cord winding solution that works with any thin cord. You open it up, put the center of the cord in the slot inside the Cordgo, and then you can wind it up to get the excess cabling out of the way. At the show, I picked up 5 for $20. The Cordgo label is just a sticker applied to the plastic. When I peeled off the label (because that's the kind of thing I do). I saw the original logo -- Cordpod. Hmm. I wonder who objected to the name? They get easier to use with time. The more you wind and unwind your cables, the easier it becomes. I guess some excess material wears away or something. I use 3 of them on a regular basis. One is for my small headphones; one is for the AUX cord for my Bose headphones; and one if for my cell phone charger. My only problem is that my Sony headphones are designed oddly. The Right headphone is attached to the Left head phone, rather than having the cord split at a Y. This limits how much I can wind them up. Still, the Cordgo helps a lot. It's not a perfect solution, but it does make my life .0058% easier. I'll take what I can get. Good buddies after all these years in Hollywood. It's pretty amazing. 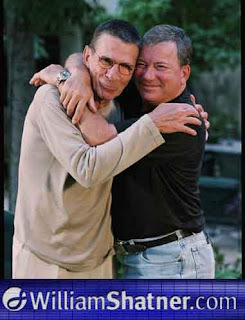 Though Nimoy doesn't seem quite as comfortable with the hug as Shatner. NEW YORK (Reuters) -- Police called to a Long Island man's house discovered the mummified remains of the resident, dead for more than a year, sitting in front of a blaring television set. I have a few random thoughts after reading this article. First, that's a really reliable TV. Apparently, it's been running at high volume for over a year without interruption. Second, you don't have to pay your power bill. Third, you don't have to pay your property tax. Fourth, neighbors will mind their own buisness. I'm not sure if this is a good way to go or not. On one hand, nobody seems to have missed the guy. On the other hand, though, it seems like he went in a rather relaxed manner. But he must have sat through a lot of reruns and infomercials. Today is the first day of the Year of the Pig. Or the Boar. This is my year. The Year of the Pig is the last year in the Chinese Zodiac 12 year cycle. Which is interesting because I am also an Aries, which is often considered the first sign of the Western Zodiac. I was born in 1971, so this will be my 4th Year of the Pig. Traditionally, each time your year rolls around is supposed to be a lucky year. I'm hoping for plenty of good fortune. How does the track record look? 1971 seems to have been a good year for me. It wasn't a bad way to start. Apparently I spent a few days under liver lights and ended up with a small scar on my foot from a clumsily executed medical test. But I don't recall much of the year. 1983 would have been the end of 6th grade and the beginning of 7th grade. Not a bad year as grade school went. We had a week long class trip to Nature's Classroom, which was the highlight of sixth grade. It's also where I first encountered Cat Stevens' music. And I had my first crush since third grade. I'm going to have to drill into my archives for more information about the year. 1995 was a pretty good year. I got my first modern computer, left Helena (1994 probably wasn't one of my better years), moved to Boise, spent 6 months unemployed, and got into computer sales. 1995 was the year that my post-college life really got started. So now I'm looking forward to another good Year of the Pig. By the end of the year, I expect to be bringing home a lot of bacon. And I hopefully, I won't end up covered in mud instead. According to customary superstition, the Pig type is usually an honest, straightforward and patient person. They are a modest, shy character who prefers to work quietly behind the scenes. When others despair, they are often there to offer support. This type of person is reserved with those they do not know too well, but as time passes and they gain confidence, those around them may discover a lively and warm-hearted person behind that mask of aloofness. Despite those born in the year of pig having a wide circle of friends and acquaintances, they have few close friends who understand them and share their inner thoughts and feelings. It is easy to put trust in pig type; they won't let you down and will never even attempt to do so. Such people simply want to do everything right according to social norms. Also according to customary superstition, that these people are not vengeful creatures. If someone tries to take advantage of them, the pig type tend to withdraw to reflect on the problem and protect themselves. All they need in such situations is a little time to find a constructive way to respond. The people of the pig type are conservative creatures of habit. They dislike being made to travel too far from familiar surroundings, unless it is a trip to the countryside. They love nature and are never happier than when they are out somewhere, far from the city. There is a tolerant and peaceful side to the character of Pig types. Such people are never afraid to allow others their freedom of expression; they do not want to cause arguments and if there is any way to avoid arguing, they will probably take this option. They are not weak, however, and if the situation forces them to fight these people will rise to the occasion, whether it is to defend themselves or those close to them. People of the Boar type are the most admired by others. You'd think the name itself would put him in the loser category, and it probably would, except that there are so many terrible names for superheroes and supervillains in Marvel and DC comic books that "Silver Surfer" doesn't even make the bottom 50. Lore Sjöberg offer a great take on terrible Super Hero names. If you don't want to read the article, you can listen to it here. For Valentine's Day, my GF and I went to Elysian Fields for dinner. I chose this place for a couple of reasons. They have a nice website. It seemed like a nice place, but not too formal. It looked like the kind of place that would have an upscale menu but still be comfortable. And due to some poor planning on my part, it was one of the few places in Seattle still taking reservations Wednesday morning. Overall, it was a nice place that's trying way too hard. Or rather, it's having an identity crisis. It want to be a "nice" restaurant, but it can't escape its brew pub roots. It is down near the football and baseball stadia in Seattle. And it can accommodate 400 people, though it had a lot of empty space when we were there. They have plasma TVs on the wall, but their smaller than you would expect. The little was more romantic than you would see in a sports bar. The booths were quiet. But the front part of the building is garage doors they can open in the summer for patio events. The bathrooms are fancy, with glass sinks, ultra-modern faucets, and black walls. The wall between the Men's and Women's rooms is made of glass blocks you can't see through, but still evoke the theoretical possibility that you could. The middle of the place is dominated by a huge bar. The servers were nice, but slow and inexperienced. Perhaps they just didn't want to wait tables on Valentine's Day. We had a crab cake appetizer, which, though small, was wonderful. And there was very little filler in them. It was garnished with a horseradish/apple concoction that was also wonderful. Here is their dinner menu. I had a small Salad Verjus (Gathered greens, honey-roasted pear, toasted hazelnuts, thyme verjus vinaigrette) which was also good. There was not has much pear as I expected, but it was still quite tasty. My GF had a beef barley soup of some sort that was quite flavorful and hearty. The included bread with her soup, but there was no butter. For the entree, my GF had the Vongole (Fresh linguini, Manila clams, garlic, olive oil, anchovy, crushed red pepper, white wine, flat leaf parsley, butter) and enjoyed that. I had the Arrabiatta (Fresh capellini pasta, garlic, shallots, crushed red pepper, rich red sauce, pancetta, shaved Reggiano), which may be the spiciest meal I've had in months. It wasn't bad, but the spicy heat overwhelmed the other flavors a bit too much. The slices of bread with each of our entrees were over-toasted, as well. Elysian Fields is an offshoot of the Elysian Ale House in Seattle, which is well know for its beers. I had the Perseus Porter, which I can highly recommend. It's a dark beer, but is also very smooth. It has little aftertaste and is just right for a chilly evening. And my GF didn't hate it when she tried it, which is really saying something. I'd go back to Elysian Fields, but with slightly lower expectations. They are doing a lot of things right, but have some trouble executing. They seem to be confused about what they want the place to be. If they can settle on a clear vision for the restaurant, and then focus on execution, they will have great place. Imagine you're a runner, looking for an edge in your race. Imagine you're allowed to wear your adult-sized Heelys and you can now shave a full minute off your 5K time. And they're a bargain at $150! How many races will you win next year owing to this great technological advance? Five? Ten? As many as you enter? There's an interesting article over at Fool.com that covers the "Paradox of Thrift." Based on the experience of Warren Buffet, the theory is that most major cost cutting moves at a company will not help investors in the long term. The idea is that a company could, for example, outsource manufacturing to China and cut its costs. Theoretically, they could see massive increases in profits then by simply keeping their prices steady. That increase in profits would boost the stock price. The problem is that those same cost cutting moves are availble to the company's competitors, too. Once they cut costs, price erosion will begin. As prices come down, so do profits. And with lower prices, they may also see even lower revenue or lower profit margins, neither of which is good for the stock price. So consumers may benefit. And these cost cutting moves may be necessary to survive in the business. But by themselves, they will not help stock investors. I've been listening to the Manager Tools podcast lately. It's available through the iTunes music store and at manager-tools.com. It's a weekly 30-50 minute audio-only podcast about Effective Management. They cover topics such as Coaching, Working with Recruiters, Writing Performance Reviews, Time Management, and other topics. The hosts are management consultants. These are the folks that big companies bring in and pay hundreds of dollars an hour for. They make their wisdom available for free. A lot of their advice is common sense, but seeing as how common sense is so rare in many organizations, it's refreshing to hear their tips. They focus on providing tips, structures, tools, and worksheets to help managers do their jobs better. If you want to improve you people management skills, or just become a more effective member of a corporate organization, listen to their podcasts. 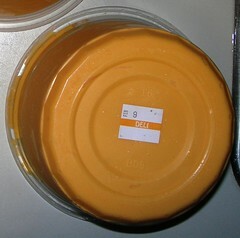 QFC has some awesome Nacho Cheese. They keep in in tubs with the other prepared foods near the Deli counter. That's where the keep the fresh stuff. That stuff must also be the most perishable and, of course, the newest and freshest, right? On Tuesday, 2007-01-30, I picked up a tub to make Nachos during the Superbowl, 5 days later. That would be the tub in the lower right. When my GF opened the tub of (what we believed to be) 5 day old cheese we found an assortment of mold that probably could have gotten us a multi-year grant from the CDC. We figured 5 days was pushing it, even though the 2007-02-09 expiration date was still 5 more days away. We tried scraping off the mold, but the cheese still tasted funny. Not Tim Conway funny. More Gilbert Gottfried funny. So that means the "fresh" cheese we bought on 2007-01-30 was probably 2-3 weeks old by the time we bought it. They really just wanted to to sell through the old stuff prior to the Superbowl. Anthony Boudain may be pretentious, self important, annoying, and loud, but he is also really funny. Here is his take on the current crop of Food Network chef. I don't agree with many of his assessments, his take on Sandra Lee is hilarious. I found this link on both Fark.com and Digg.com. My cable Internet connection went out for some reason. I've done the basic rebooting everything step, and that did not fix it. So now I'm accessing the net through my Sprint EVDO card. Comcast as a nice feature on their website -- it will tell you if there are service outages in your area. This is a great trouble shooting tool. LONDON, England (Reuters) -- Six people were hurt in Britain on Wednesday by the latest in a series of letter bombs, but police said they believed the devices were intended to shock, not kill. Wednesday's blast at the Driver and Vehicle Licensing Agency in Swansea, south Wales, was the third in three days aimed at agencies or contractors involved in enforcing traffic rules, leading media to blame disgruntled motorists. So that's why Lefty had to sneak around in that trench coat when he met with Ernie. He was a terrorist. If you don't follow Heroes, you will have no idea what I'm talking about. How is it that Horn Rimmed Glasses guy still has his job at "Primatech" or whatever it is he works for? He captures the serial killer. The serial killer then kills his top aide who was instrumental in the organization's success. Then he lost the serial killer he just captured. According to the graphic novels at the Heroes website he trained and then lost "Wireless" and Isreali Hero who can hear and access all electronic communications. He let the invisible guy get away years ago. And he seems to erase his wife's and daughter's memories every week. Must be a civil service gig. Conduct unbecoming an officer; two counts, each carrying a maximum penalty of one year in prison. • One count results from statements Watada made at a June 7 Tacoma press conference, when he said, in part, the war was a "horrible breach of American law," and that his participation in the "wholesale slaughter and mistreatment of Iraqis" would make him a party to war crimes. 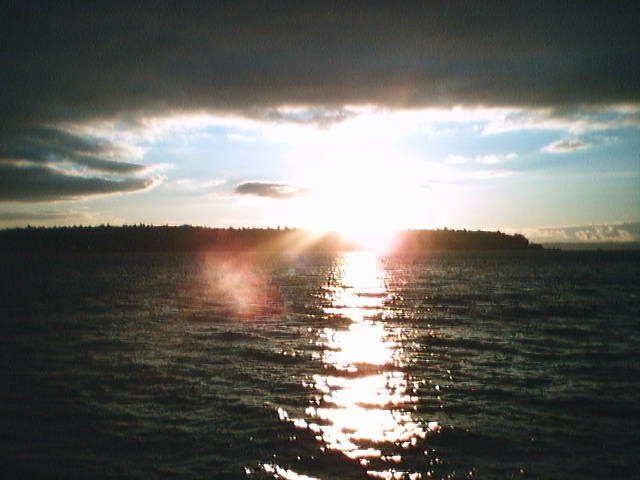 • The other count results from an Aug. 12 speech Watada gave at Seattle convention of Veterans for Peace, when he said, in part, "We must show open-minded solders a choice, and we must give them the courage to act. ... I tell this to you because you must know that to stop this war, for the soldiers to stop fighting it, they must have the unconditional support of the people. ... Never again will we allow those who threaten our way of life to reign free — be they terrorists or elected officials." This interesting story has been unfolding in the Northwest over the past several months. Lt. Watada refused deployment to Iraq because he is conviced the war is illegal. And he has spoken out against it. Previous articles I read cited Watada personal history of deeply considering his beliefs. And once he belives in something he stand up for it. Now, throwing in a voluntary committment to military service makes the issue more complex. Part of the question becomes doyou obey an order that you truely believe to be illegal and immoral? That will be a major part of his defence, I'm sure. Some anti-Watada protestors have called him a coward for refusing the Iraq deployment. That accusation is misplaced, though. Watada volunteered for service in Afghanistan - a place just as dangerous. He was perfectly willing to go there instead of Iraq. It wasn't a question of avoiding combat - he simply did not want to take part in what he saw as an illegal conflict. Secondly, Watada is going through his Court Martial. He didn't try to hide. The military didn't have to hunt him down and capture him. He is standing up for his beliefs when he easily could have fled. Watada may be many things. But a coward isn't one of them. I'm not sure what the ultimate outcome of the Court Martial will be. I'm not even sure what I think it should be. But it will be a fascinating story over the coming months. I spent the past couple evening playing Vampire: The Redemption on my PC. The game hit the market in 2000, and I've been playing it sporadically every since then. By sporadically, I mean a couple times a year. One of these days I'll finish it. I think I need just another 16 hours. Speaking of games, who could forget the arcades of the 80s? The folks over at CenemeArcade.com created a virtual arcade walk through. You can find the 30MB download here. A couple years ago Choice Hotels International, which includes Sleep Inn, Comfort Inn, Quality Inn, Clarion, and others began using Johny Cash's "I've Been Everywhere" in their ads. One of the commercials features an older couple travelling around the country and reliving their youth. Here are the lyrics. 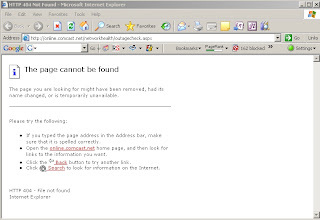 On 2007-01-25, my GF ordered a jacket from Eddie Bauer and paid extra for the 2 day shipping option. 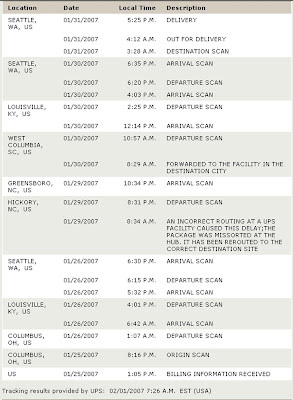 For some reason, the package crisscrossed the country more in one week, than, well, I do. As you might expect from that cross country journey, that packaging took a bit of a beating. But the jacket eventually arrived unharmed. And Eddie Bauer did refund the express shipping charge. But I still want that package's frequent flyer miles.